Web pages may contain text, images, video, audio, and other types of information. These will be part of the Web page, or they will be accessed with hyperlinks. Information available on the Web is in a myriad of file formats. This chapter covered the common types of files that are found on the Internet and how to work with them. You can usually tell a files type by its name. The letters following the dot (.) at the end of a file name are called the file extension portion of the file name. You may find yourself in a situation where youll have to deal with compressed files. Before you can use a compressed file, you must uncompress it, using PKZIP or WinZip. Using information from the Internet requires a familiarity with intellectual property issues. Much of what you find on the Internet and World Wide Web can be downloaded and distributed to others easily. Only the owners of the information can grant the right to copy or duplicate materials. This is called the copyright. In almost every case, you are required to obtain written permission from the copyright holder before distributing information on the Internet. Most copyright laws include a provision that makes it possible for individuals to copy portions of a document for short-term use. This is known as fair use. There are many browser capabilities that allow you to download, capture, copy, email, and print information from the Internet. These basic skills were outlined in this chapter. 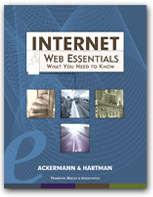 If differences exist between the two major browsers, Netscape and Internet Explorer, then each procedure was explained. Copyright is the right to copy or duplicate material such as images, music, and written works. Only the owners of the information can grant this right. Regardless of whether information on the Internet or a Web page is accompanied by a statement asserting copyright, it is still protected by the copyright laws of the United States, the Universal Copyright Convention, or the Berne Union. Descriptions of the different file formats used on the Internet and the Web. Also contains information about the programs you can use to work with some of the file formats.